Northern Illinois turned a 21-14 halftime advantage over Buffalo into a 45-14 Homecoming victory Saturday at Huskie Stadium as NIU won its fourth straight game with a dominating second-half performance. With the win, the Huskies improved to 5-2 overall, 3-0 in the Mid-American Conference. Buffalo dropped to 2-4, 0-2. 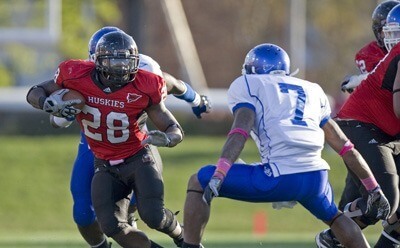 Tailback Chad Spann rushed for 111 yards and two touchdowns in NIU's 45-14 victory over Buffalo. On a windy day in DeKalb, the Huskies totaled 281 rushing yards on 50 carries in the game and averaged 5.6 yards per rush. Tailback Chad Spann, the MAC’s leading rusher, led the way with 111 yards on 31 carries and a pair of touchdowns, while quarterback Chandler Harnish added 75 yards on 14 carries with a 12-yard touchdown run and back-up quarterback Jordan Lynch iced the victory with a 90-yard scoring run in the last five minutes of the game. Meanwhile, the Northern Illinois defense limited Buffalo to 130 rushing yards while UB quarterbacks completed just nine-of-26 passes for 120 yards. More than two-thirds of Buffalo’s passing yards – 81 – came on a single play as Bulls’ quarterback Jerry Davis hit Marcus Rivers on a long touchdown play with 31 seconds left in the first half, making the halftime score 21-14. It was the last time Buffalo would reach the end zone on the day. Harnish was excited about the Huskies’ second-half play. Northern Illinois extended its lead to 24-14 on the first drive of the second half when Michael Cklamovski hit a 34-yard field goal to cap a six-play, 40-yard drive. The Huskies went ahead 31-14 on its next possession as Spann scored his second touchdown of the day on a two-yard run to finish an 11-play, 57-yard drive. The Huskies stopped Buffalo on fourth-and-two from the NIU 31 on the first play of the fourth quarter and after the teams traded punts, Harnish led NIU on an eight-play, 47-yard drive and took it in himself from 12 yards out to give Northern Illinois a 38-14 lead and end his day. Lynch took over on NIU’s next possession, got into the secondary and scored on a 90-yard rush, the fourth longest run in Northern Illinois history and the longest ever by a Huskie quarterback. It was also the longest run by a Northern Illinois player since 1993. The two teams played a scoreless first quarter before Harnish hit Landon Cox on a 10-yard touchdown pass at the 11:58 mark of the second quarter to open the scoring. Buffalo tied the game on a 27-yard interception return by Gordon Dubois as Harnish threw his first interception in 108 passes dating back to the North Dakota game. The Huskies responded with a 25-yard touchdown pass from Harnish to Willie Clark that came after NIU’s Tommy Davis recovered a fumble on the UB 32-yard line. That score put the Huskies up 14-7 and minutes later Northern Illinois extended the lead to 21-7. Spann scored on a one-yard run after an interception by Chris Smith and his 21-yard return gave the Huskies the ball at the five-yard line. Northern Illinois plays its third straight home game next Saturday versus Central Michigan. Kick off for the contest, which will air on Comcast SportsNet Chicago, is at 3 p.m. from Huskie Stadium.